The Acropolis Museum is an archaeological museum focused on the findings of the archaeological site of the Acropolis of Athens. The museum was built to house every artifact found on the rock and on the surrounding slopes, from the Greek Bronze Age to Roman and Byzantine Greece. It also lies over the ruins of a part of Roman and early Byzantine Athens. The museum was founded in 2003, while the Organization of the Museum was established in 2008. It opened to the public on 20 June 2009. Nearly 4,000 objects are exhibited over an area of 14,000 square metres. 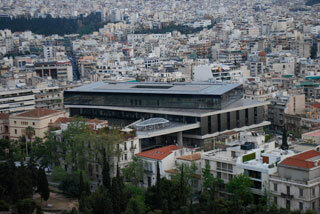 The Organization for the Construction of the new museum is chaired by Aristotle University of Thessaloniki Professor Emeritus of Archaeology, Dimitrios Pandermalis. This article uses material from the Wikipedia article "Acropolis Museum", which is released under the Creative Commons Attribution-Share-Alike 3.0 License.